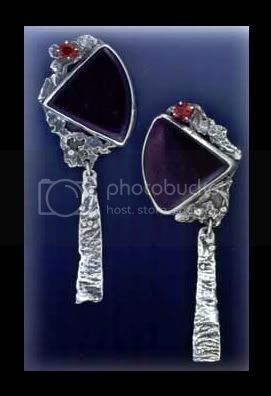 Fused Drop Earrings These pieces represent the type of exquisite contemporary jewelry you can expect from ROGER MATHEWS' GALLERY. No two are ever alike, having been wrought from silver, individually selected stones from across the nation, and artistic inspiration by Roger, master silversmith. Do you have a special dress that needs a glorious piece of jewelry to perfect the look? You can tell us the colors, type of stones, the design, or even just the mood you're after, and Roger will create an unforgetable work of art just for you. We hope you'll find inspiration from the tour.